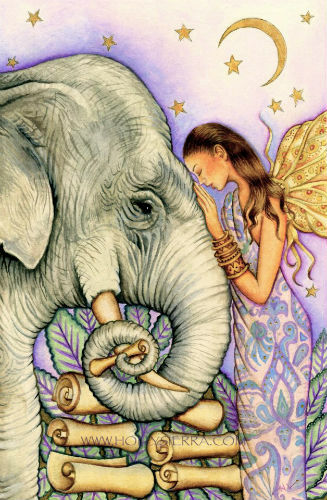 You may be called upon today to find your inner reserves of strength and overcome your deepest fears. The Strength card is all about mind over matter and gaining control over the things in your life that are at risk for spiraling out of control. It refers not to physical strength but to courage, will-power and self-control. It can also mean digging deep and finding an appropriate outlet for something that you may have responded to in a less than favorable manner in the past. 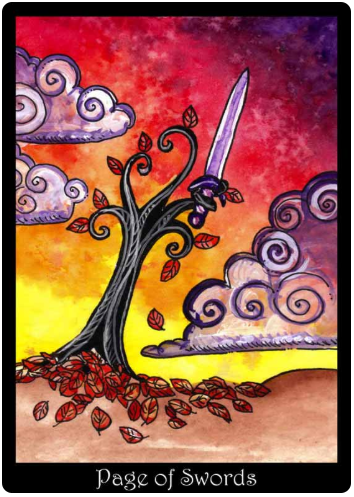 The Strength card — this version from the beautiful Crystal Tarot by Philip Permutt — indicates a need to master your fears and conquer your demons. It indicates a need to gain control of the “beast” within. 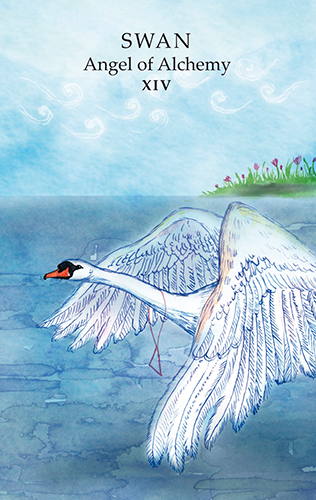 The Strength card speaks of the importance of staying grounded and being steadfast in the face of danger, and whatever curveballs the Universe throws your way. You may need to put on a brave face and tackle the things that frighten you or take you outside of your comfort zone. You may also need to be kind to yourself and tend to your own needs with the same loving care that you’re used to doling out to others. Take some time today to get in touch with your own capacity to stand up to the challenges that present themselves and face them rather than cowering in fear. You may be surprised at your ability to remain composed when need be. You may be surprised to learn that you’re stronger than you know. Today you may need to be extra gentle with yourself and tend to your own needs with the same loving care that you’re used to doling out to others. You may be putting on a brave face as you tackle things that frighten you today, or that take you outside of your comfort zone. 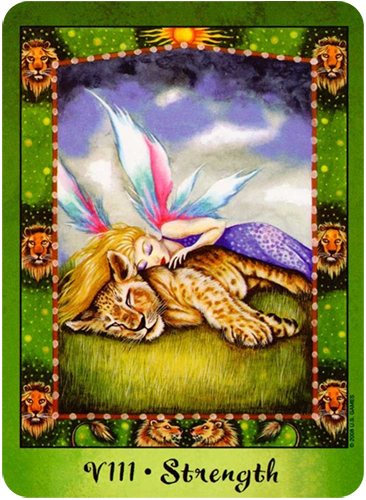 Or you may — like the faerie in the card, from the beautiful Faerie Tarot — recognize the value of taming your inner beast and becoming one with it. 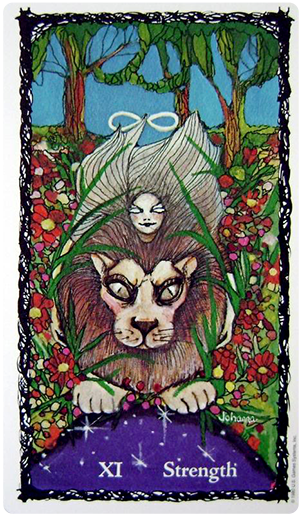 Venus retrogrades back into Leo today, bringing us all a little closer to taming the lion within. We might be asking ourselves what we’re struggling with that requires us to dig down deep and find our inner reserves of strength. 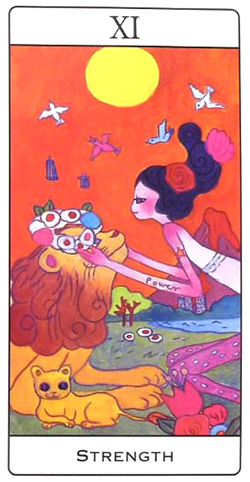 Today’s card — Strength from the Sacred Rose Tarot — is all about mastering our fears and conquering our demons. It’s about gaining control of the “beast” within. It refers not to physical strength but to courage, will-power and self-control. It can also mean finding an appropriate outlet for something that you may have responded to in a less than positive manner in the past. Whatever it is, know that this card encourages you to stay on course and not fall back into unhealthy reactions or patterns. 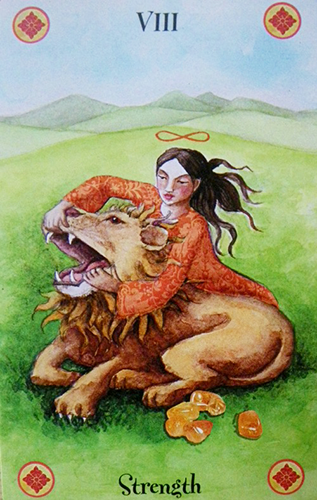 The woman in this card has literally become one with the Lion. She wraps her arms around him in a loving embrace, while still granting him the honor and respect he deserves. She knows that the key to success comes from both gaining the Lion’s trust and not giving into her fears. 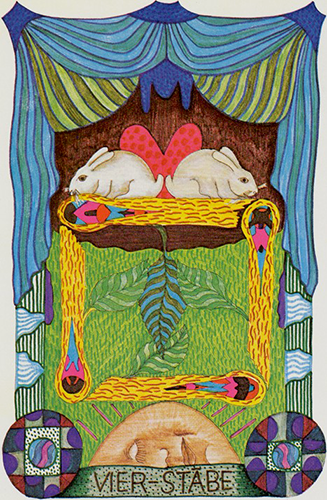 The imagery in this card is all the more poignant, in light of recent events. As Venus moves back into Leo today — and as we are greeted with a “once in blue Moon” Full Moon in Aquarius — we want to remember that there’s a place in the world for all of us and that each of us are deserving of compassion and respect. 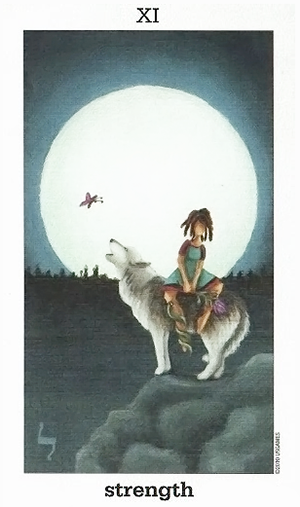 The Strength card reminds us that we all also have access to a wellspring of personal strength and power. How we use ours — and what impact our using it has on the rest of the world — will say more about our true character than just about anything else. You may be called upon this month to reach into your inner reserves of strength and overcome your deepest fears. The Strength card is all about mind over matter and gaining control over the things in your life that are at risk for spiraling out of control. It could be as simple as a pattern of second guessing yourself or talking yourself out of doing what you know is best for you. And it can be as complicated as upholding your part of a bargain you’ve made with yourself: quitting smoking for example. Dieting. Sticking to an exercise regimen. Holding your ground against temptations to “give in” when you know that doing so is not going to be in your best interests. 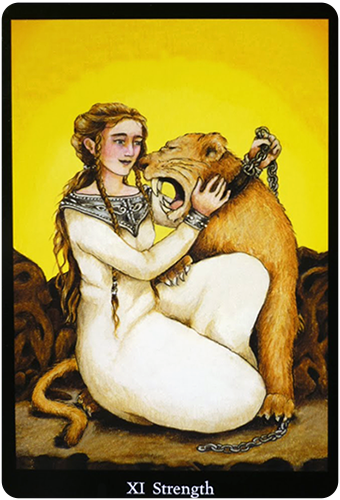 The woman in this card — from the Aya Takano Tarot — has managed to tame the beast through kindness and generosity. But she’s not exactly lying down and exposing her underbelly. Her demeanor is both soothing and reverent as she places the wreath of flowers over the lion’s mane. I love the “power” tattoo on her forearm. Think about how far you’ve come in taming your own inner beasts. If you’re tempted to throw in the towel, remember that doing so will only cause you to lose momentum. The Strength card encourages you to not only meet your fears head on, but to transform them by neutralizing the power they hold over you. Once you do that you’ll find that they weren’t so frightening after all. Perhaps there is something you wish to say but are not saying it. 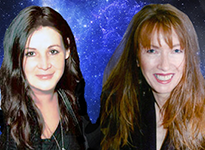 Intuitively you may know it is not the right time to speak these words so you hold them to yourself. If this is the case then know that when you do speak your mind the words will come out in an empowering way which will give you further strength to do what you need to do next. On the other hand if you have been biting your tongue for too long and not expressing what it is you want to say then you may miss your opportunity. lf that is going around your mind may become entrapped in a never ending cycle of not being able to choose the correct moment to speak out. In which case when you do speak you find you have an argument on your hands instead of your own empowerment that you are wishing to convey. 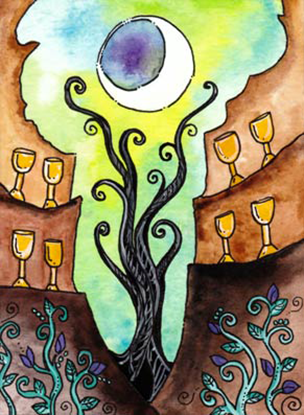 It is easy to see that this card is associated with the sign of Leo — which is where the Full Moon is today, like the full moon in this card. 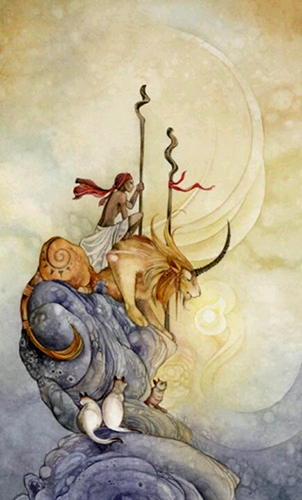 Just just like a Leo who inspires greatness in those around them as well as themselves you need to realize that you hold the strength and purpose within you to get what you want and if that is not forthcoming then know when to walk away. There is only so much a person can take of feeling as if they are always renouncing their own truth. If this has been you then know that you have the strength within you to rise above circumstances that may be holding you down and walk your own path.